Today, cameras have become smaller and cheaper and can be utilized in various scenes. We took advantage of that to develop a thumb tip wearable device to estimate joint angles of a thumb as measuring human finger postures is important in terms of human-computer interface and to analyze human behavior. The device we developed consists of three small cameras attached at different angles so the cameras can capture the four fingers. We assumed that the appearance of the four fingers would change depending on the joint angles of the thumb. We made a convolutional neural network learn a regression relationship between the joint angles of the thumb and the images taken by the cameras. 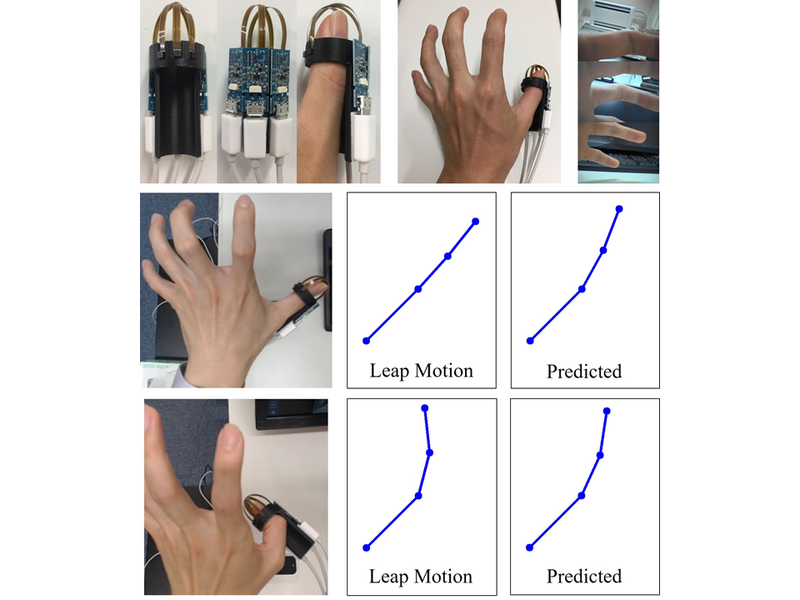 In this paper, we captured the keypoint positions of the thumb with a USB sensor device and calculated the joint angles to construct a dataset. The root mean squared error of the test data was 6.23 and 4.75 degrees.